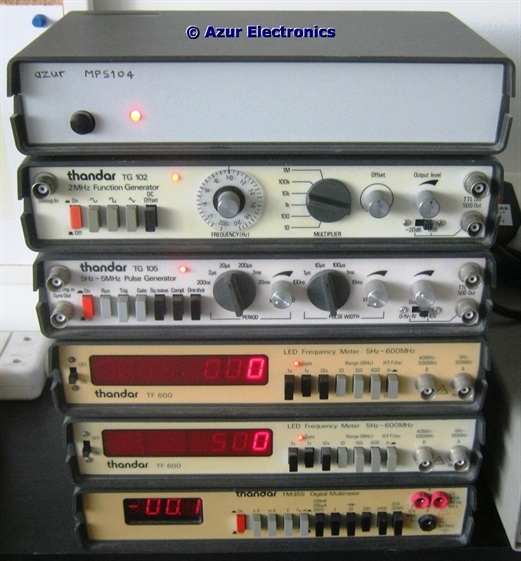 Thandar Electronics Limited of Huntingdon, Cambridge were originally Sinclair Electronics Limited and later merged with Thurlby Electronics Limited to form TTI (Thurlby Thandar Instruments Limited). Many of their products were branded as RS Components Limited. 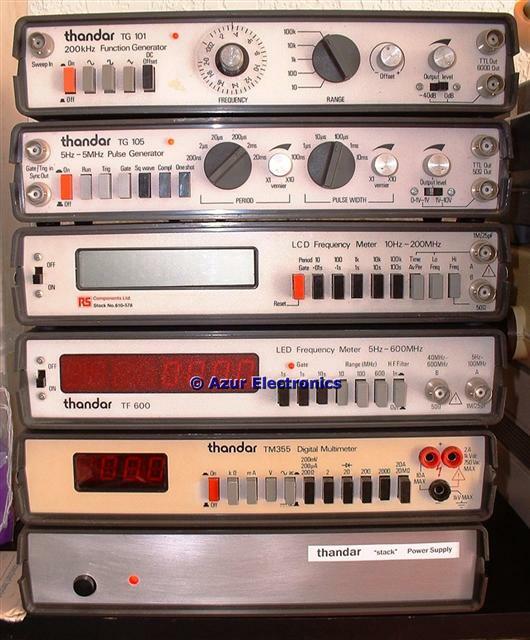 Thandar produced low cost function generators, frequency meters, DMM's and even oscilloscopes. Thurlby produced power supply units and some other test equipment. 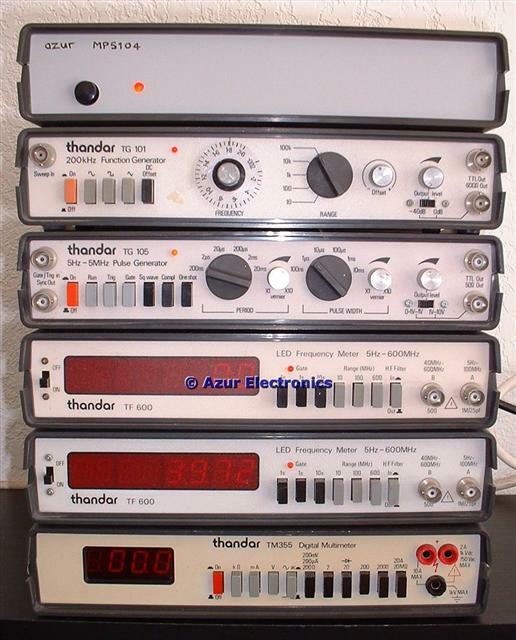 Thandar TG101 200kHz Function Generator. See Signal Generators for details. There is also a TG102 which goes up to 2MHz. 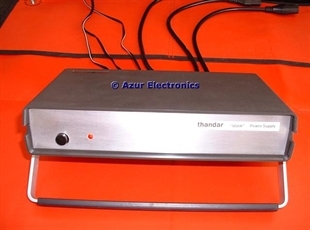 Thandar TG105 5Hz to 5MHz Pulse Generator. See Signal Generators for details. Thandar TF200 LCD Frequency Meter measures frequencies from 10Hz to 200MHz with high and low frequency inputs and various gating times from 0.01s to 100ns. Internal 4MHz Crystal Oscillator or 1MHz external clock input. With Instruction Manual. See also Frequency Counters. Thandar TF600 LED Frequency Meter measures frequencies from 5Hz to 600MHz with high and low frequency inputs and gating times of 0.1s, 1s & 10s. Internal 10MHz Crystal Oscillator or 10MHz external clock input. Thandar TM355 Digital Multimeter. See Multi-Meters for details. 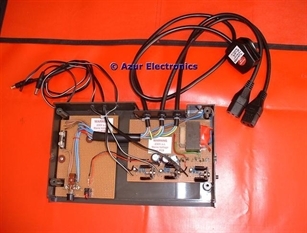 Azur MPS104 Thandar "Stack" Power Supply. Needed by the TF200, TF600 and TM355. This Power Supply was designed and built into a Thandar Instrument Case (Part Number 51200-0010). This was needed as the TF200, TF600 and TM355 are battery powered with a dc connector for an external mains power adaptor. As the batteries have been removed, individually regulated (for additional isolation) -9V dc was provided for the 3 units. Also, mains power feeds to the TG101 and TG105 were provided, so that everything can be powered from 1 socket outlet. I have bought another TF600 to replace the TF200 which has been sold. The higher frequency bandwidth and the 10MHz clock makes the TF600 more versatile. I also prefer the red LED display which I find is more easily readable than the LCD display especially in low light conditions. The 2 TF600's have a 10MHz internal crystal oscillator/external clock (unlike the TF200 which was 4MHz/1MHz). To improve accuracy these will be locked to the HP 5342A Microwave Frequency Counter which has a 10MHz TCXO. Bought a Thandar TG102 Function Generator to replace the TG101. The TG102 operates up to 2MHz instead of 200kHz and has a 50Ω output instead of 600Ω.